There are only three things I don't like too much about the beach. I don't like the sand that gets into everything, the salt in the water that makes you gag when you swallow too much and the waves that dunk you into the first thing I don't like - the sand. Otherwise, I don't mind the beach. So what are we doing here at 5:30 in the morning? We are getting our Kayak ready for the 4-hour Bayside Rogaine. Once again we were lucky with the weather. It is an overcast morning and not too hot for a leisurely paddle. We got our maps and were faced with a decision. The course consisted of a paddle section (that is not so surprising as it is a paddlegaine, and also the kayaks gave it away), and a roughly 12 km running course on South Stradbroke Island. The run would be pretty tough as it was all sand and high tide i.e. not much hard sand. The choice was to do a long paddle around Coomera Island (about 25 km) or do the run and pick up some kayak checkpoints on the way. We counted up points and the long kayak section won over the run course. The tide and the wind also were in favour of doing the long kayak leg. Apart from my problems with the beach I am also not the most flexible person and was a bit hesitant of getting into a sardine can (i.e. kayak) for 4 hours. But what the heck. About half the teams seemed to have chosen along the same lines and when we got to the first check point we were well and truly last of that bunch. But we steadily started catching up and also made some good decisions in regard to route choice and finding the checkpoints. Most of the checkpoints required only a couple of steps out of the kayak, but some you had to do a small hike to through the mud. For some reason I was in my element, I even enjoyed the sand and salt (there were no waves to worry about). We even were blessed with a couple of showers of rain that cooled us down a bit. We got out of the creeks/canals into the bay with about one and a half hours to go. Kerrie started cramping but didn't complain, at least I didn't hear it. With only one hour to go we had some indecision for about 3 minutes on whether we should go for a 90 point checkpoint or whether we would run out of time. It was an additional 2 km return journey. That's when one other team came from behind heading for the 90 pointer. That's all we needed to convince us, Kerrie and I don't mind a bit of competition or challenge. Kerrie dug deep and was moaning and groaning a bit. But we found the checkpoint alright and made it back with even 10 minutes to spare. I suggested to Kerrie that maybe we should have got another one that we left behind. I had just enough time to duck and miss the swipe, but I didn't miss the scowl. Kerrie was pretty sore paddling through her cramps. We had awesome fun and the pizzas afterwards, topping off another perfectly organised rogaine. Thank you very much to the organisers and all the volunteers that made it all happen so smoothly. I might even get to like the sand, salt and waves. 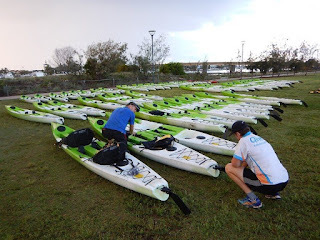 But that's not all, after presentations, Kerrie and I participated in a paddle clinic run by Michael Baker (5x Avon Descent Winner, National Sprint Kayak Representative, Ocean racing world-series racer, Surf Life Saving Head Coach). This was the best $5 each we spent in a long time. We learned heaps and now know what to practice to improve our paddling skills. So look out guys, we hopefully will be faster next time.